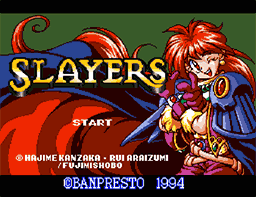 8 years to the day since I began seriously working on the project I'm proud to say that an English translation patch for Slayers on the Super Famicom is finally publicly released! The patch includes a full re-write of the script which is very entertaining and well done. Effort has been made to preserve the integrity of the game's code and it should play perfectly on real hardware. The game is outrageous and comical in many areas. Expect a typical RPG experience that's anything but typical! After all, it's Slayers! Please enjoy this little effort of ours at bringing this game to an English speaking audience and a nostalgic "what-if" experience as you get to play this game in English almost 16 years after it was originally released. For further details please visit my Slayers SFC English Translation project page.